Every investment portfolio should contain a precious metals component to help limit risk exposure and volatility. That’s because precious metals—particularly gold and silver bullion—tend to perform extremely well in market conditions while more traditional asset classes such as stocks and bonds tank, thus protecting and growing wealth even in tumultuous times. As you evaluate the different types of precious metals investments available, we urge you to consider the following advantages of gold and silver bullion compared to other options. ETFs are problematic for anyone with a long investment horizon, including those saving for retirement. They are strictly electronic and do not provide investors with the safety and security of a wholly tangible asset like physical gold or silver bullion. Also, ETF capital-gains taxes are higher than for stocks and bonds. And they do not offer the tax-free growth opportunities that come with gold and silver IRAs. Mining stocks offer investors shares in precious metals mining companies, and as such, carry the same inherent risks as other types of equities. Rather than getting physical gold and silver bars or ingots that you can store in a vault and access whenever you wish, you’re putting your faith (and hard-earned money) into the management ability of the mining company’s executives. If the company goes belly up, your mining stocks will become worthless—something that would never happen with physical bullion. 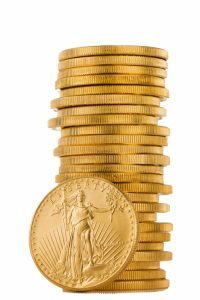 While it’s true that some rare numismatic coins can attain a market value that far exceeds the intrinsic value of their precious metal content, this might not happen often enough to warrant serious investment for the typical investor. And unlike many gold and silver bullion coins such as American Eagles or American Buffaloes, numismatic coins are not eligible for retirement accounts or the associated tax breaks. If you wish to diversify your investment portfolio, contribute to your precious metals IRA, or preserve the value of your money in a tangible asset, then gold and silver bullion is the way to go. Visit AmericanBullion.com today for information on how to get started.